IMPORTANT! RIDERS BRIEF FOR SAT 16th SEPT 2017. BRAND NEW ‘RIDE ON NELLY’ JERSEY & CAPS ON SALE NOW! With your incredible help (and incredible legs!) over the last 3 years Nelson’s Tour de Test Valley has raised more than £150,000 for CALM, helping to prevent over 765 suicides. We have put this graphic together to show you exactly where all those pedal revs, hard work and your precious pennies have gone, and the HUGE impact it’s had on peoples lives. The event and CALM can’t thank you enough. The facts surrounding male suicide are still staggering and resonate with Nelson’s story so clearly. Suicide is the largest killer of men under 45 in the UK. Of these suicides 76% are male. That means 12 men a day are committing suicide, costing the country roughly £20 million a day. If this list of facts doesn’t make you gasp for breath then I’m not sure what will. The fight clearly isn’t won. These facts are just not known enough. Nationally only 29 people in every 100 correctly identify suicide as the single biggest killer of men. Scary. CALM continues to lead the way is raising awareness and reducing stigma with hugely successful campaigns such as #BIGGERISSUES with Lynx, and being involved in the current #itsoktotalk campaign sweeping the internet. Through CALM’s work and all this positive noise men are starting to open up, and the help for them when they do is improving. The ‘silent is strong’ culture is finally shifting. 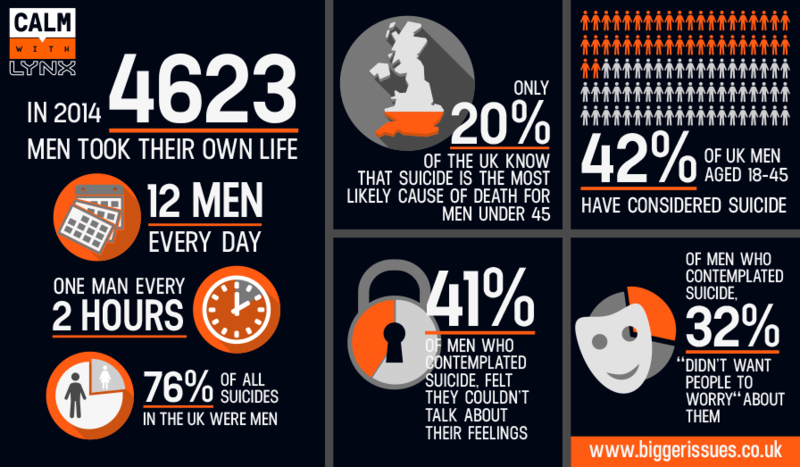 Male suicide and the eye watering facts have to become public, the stigma has be slashed, men have to be encouraged to talk by other male figures they respect, and there has to people there to listen to them. CALM has a helpline providing phone and webchat, so CALM is ready at the front line. Help us continue to lead the charge.